???MATH?? ?V_1, V_2, V_3 ... ???MATH??? 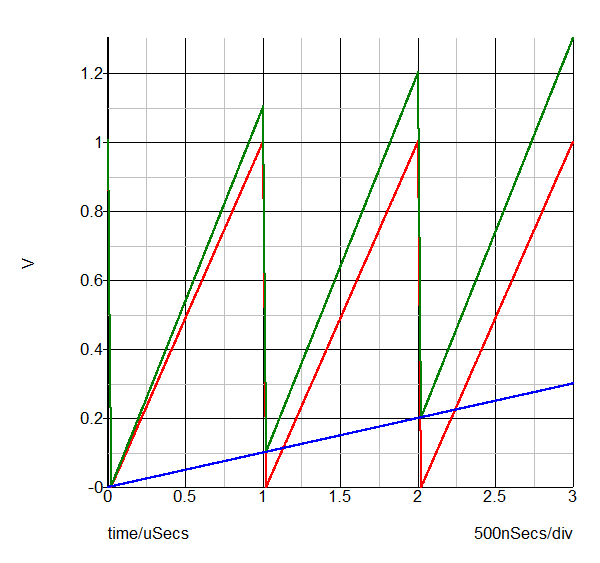 are the time dependent input signals. Additionally, ???MATH???K_0???MATH??? is a constant offset which can be added to the output. The default value of ???MATH???K_0???MATH??? is zero. The summer blocks are completely general purpose. The modeling techniques used in these blocks are optimized for both numerical accuracy and simulation speed. These obsolete summer symbols use the same electrical model but with a different symbol and editing dialog. Gain for input #1 V/V The gain of the first input. The gain can be negative to implement the difference of two input signals. Gain for input #2 V/V The gain of the second input. The gain can be negative to implement the difference of two input signals. Annotate pin? If Checked the pin will be annotated with the Annotation text. One of the new features added to the summers is the ability to add text annotation to the input pins. This annotation is purely for descriptive purposes and is not used in the electrical model. 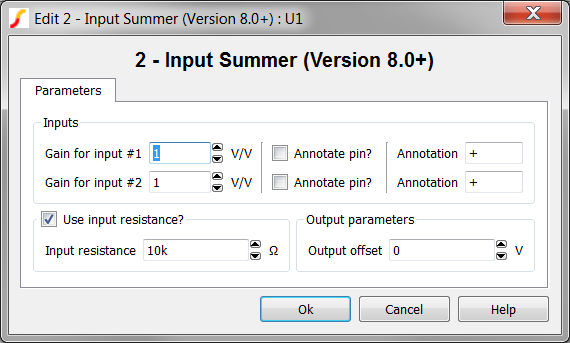 A simple example is a 2-input summer used to produce the difference between two signals. Adding "+" and "-" annotations to the pins will make the schematic easier to read. The test circuit used to generate the waveform examples in the next section can be downloaded here: simplis_075_simplis_summers.sxsch. This example adds a high frequency oscillator sawtooth waveform to a slow moving ramp voltage. The sawtooth signal is red, the slow moving ramp is blue and the output is green.